Giant Armored Slugs are rarely found in the wild. 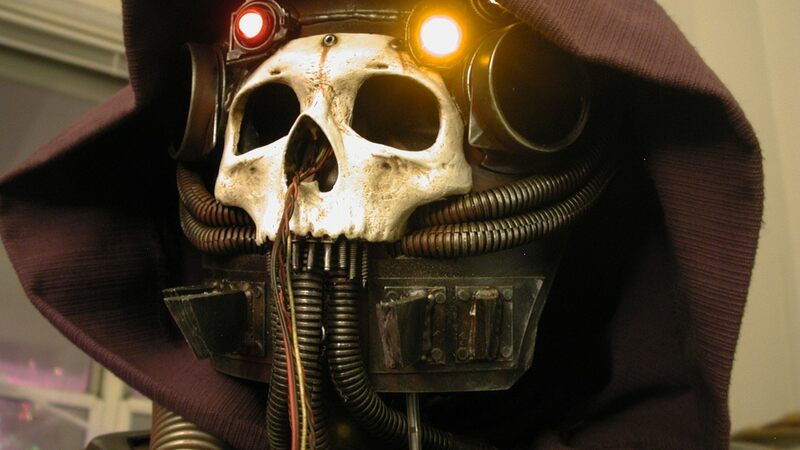 Instead, they are often used as minions for powerful wizards and priests. Standing nearly 4' tall and possessing a minimum of reasoning ability, Giant Armored Slugs - often referred to as Sluggards - can understand the common tongue of man and are able to converse in three to four word sentences. Although they lack hands, their tentacled limbs allow them to wield weapons with some proficiency.Their skin forms a chitinous sort of armor but perhaps their best defense is their trail of slime, which radiates in a 5' circle around them and has been known to cause many an attacker grief. Special: Slime - Anyone standing within 5' of a Sluggard must make a save or be at -2 to attacks due to poor footing. Leaving the 5' radius ends the effect. Wow. Its been a busy week here at The Tavern. 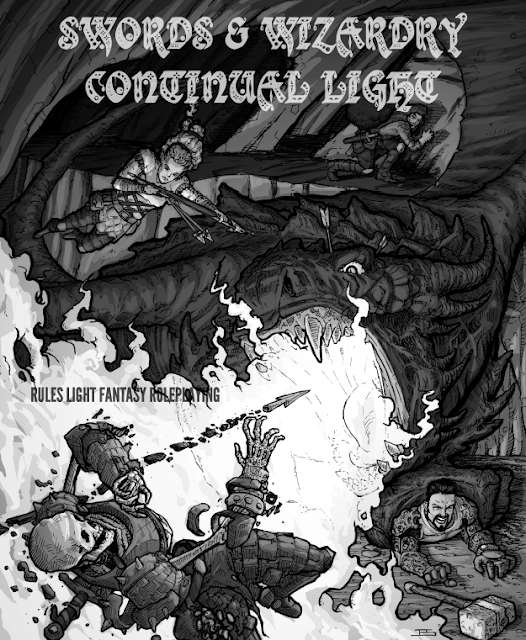 After stepping away from InDesign and moving back to Lucid Press, I finally got Swords & Wizardry Continual Light laid out. 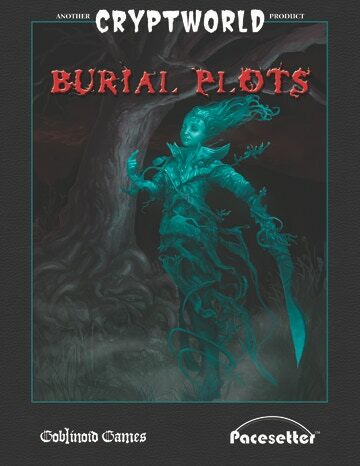 Earlier this evening I submitted the PDF file to OneBookShelf. 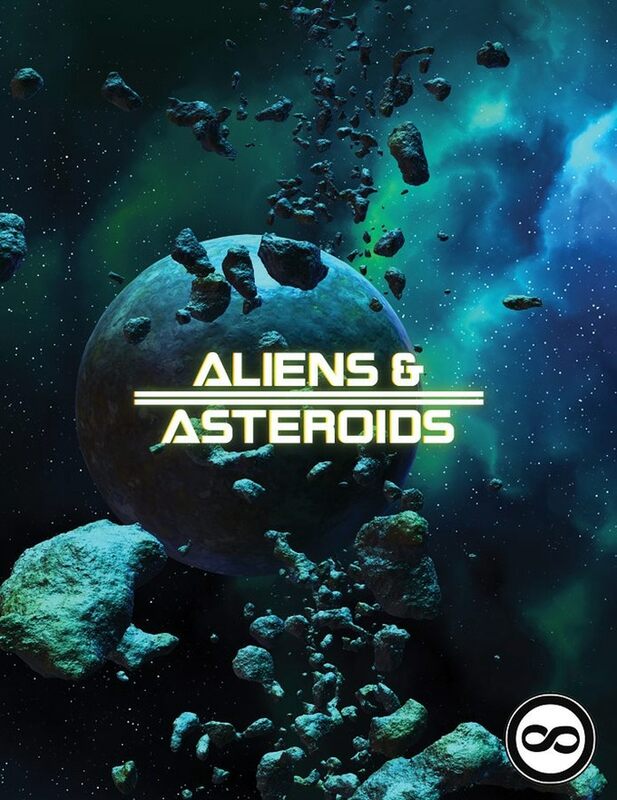 As a still wet behind the ears publisher I have to wait a few days for it to get approved. Just know it's in process and around the corner. In the meantime, I may simply print out a few dozen copies in digest format. I just ordered a decent paper trimmer on Amazon. 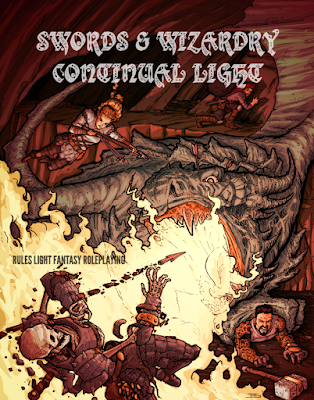 Oh, and before I forget, there is a Slasher Hack for Swords & Wizardry Light that just released by Justin Isaac for the amazing price of FREE! I love finding SWL hacks in the wilderness. You can grab Slashers & Victims Light here. Worlds of Empyrea had a fairly strong start to its funding, but compared to its lofty goal of $250k it was fairly apparent it was most likely to fall short. This, it was announced last night that the Kickstarter would be rebooting this coming Monday - 10/16/17. 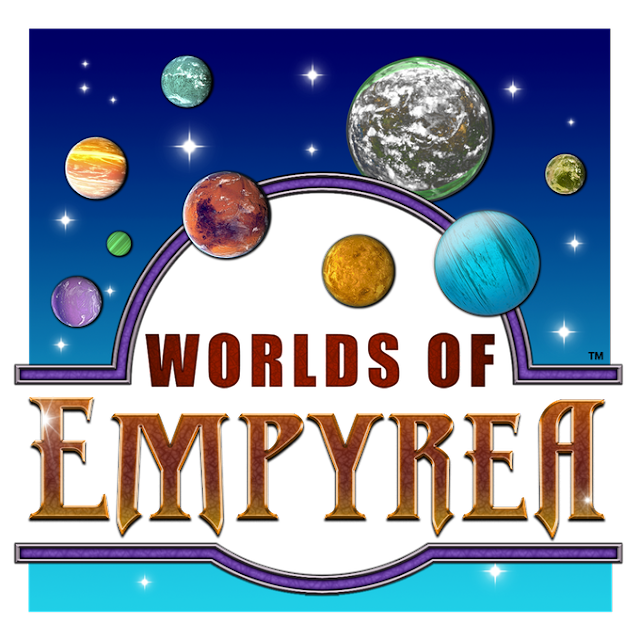 Strangely enough, the current Kickstarter is still open for new pledges. More details of the actual project - looking at the preview page, this has been done. Actual updates - first update was the only one in a week and a half and that was last night announcing the reboot. Generate excitement ON the Kickstarter page itself. 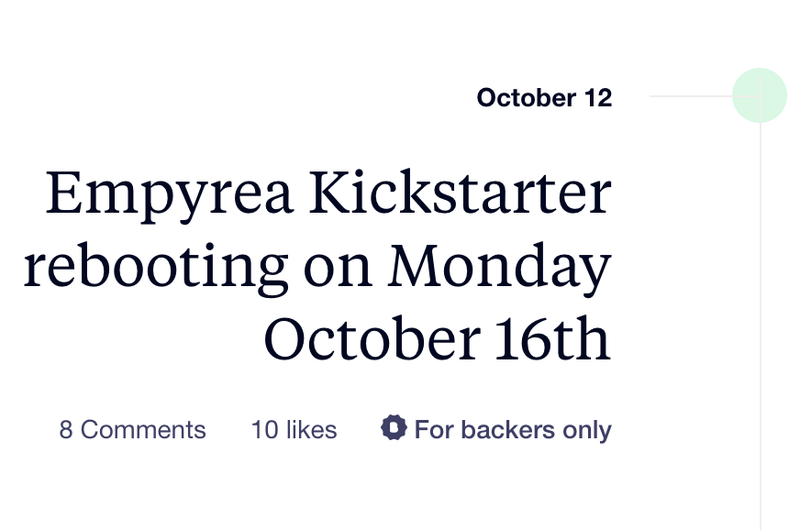 Social media and interviews are fine, but a lively Kickstarter page draws in backers. 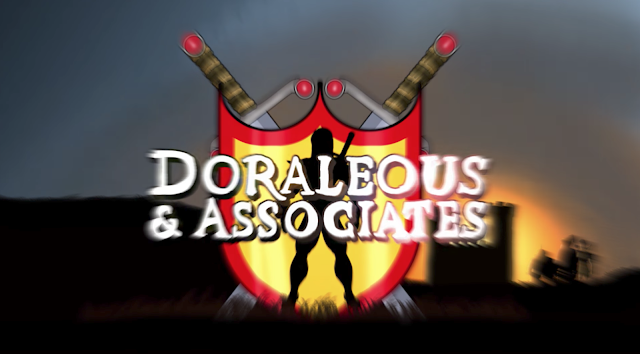 This means frequent updates with meat on the bone and lively and timely responses to backers on the comments page. The list of Legendary Guest Artists is impressive and extensive. 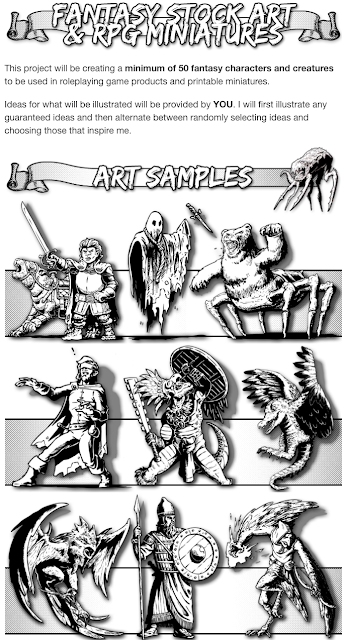 What we need is some sample art from those listed. I'm far from a Kickstarter expert. I've never run one. I do, however, follow them closely. We'll follow up on Monday with the Reboot Announcement. In any case, the latest KS from Impact Miniatures - D20 / D30 RPG & DCC Dice Chain Sets -New D17, D19, D26 & D28 - just launched yesterday and it has funded AND already hit its second stretch goal. 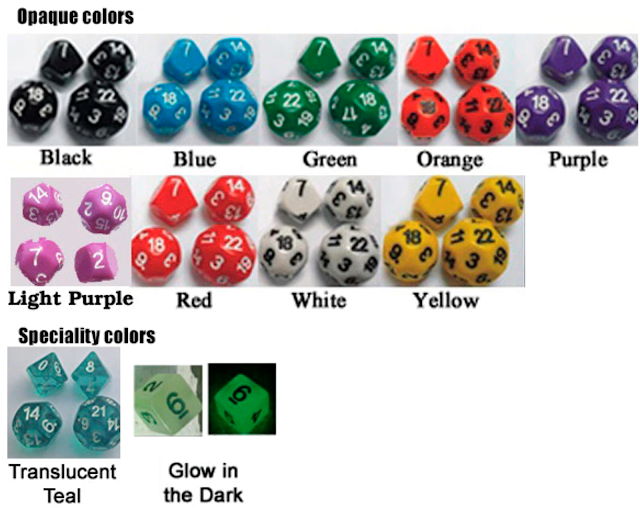 Impact Miniatures Kickstarters are all about customizing the dice you get - seriously, go to the page linked above and look at your options. I'm sure you'll find the right one for you. Where? The Tavern's Discord Server. We mostly use voice these days. Some just hand out to listen. Over 20 logged into the voice chat is not unheard of. Text Chat is fairly lively too. Voice chat is held in the Open Bar Channel. Text chat for tonight will be held in tavern-chat-wed-9pm-eastern. See y'all in just over an hour. Sure, maybe it doesn't say Supplement V on the cover, but we've all referred to it as that. 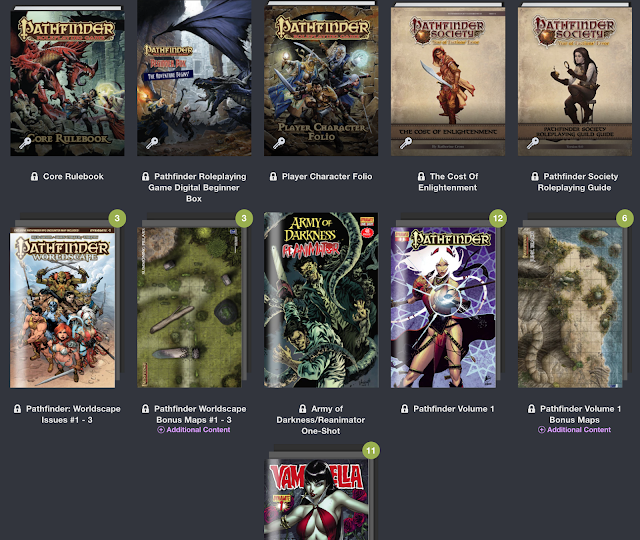 $4.99 in PDF, $9.99 on POD and $11.99 for PDF + POD. 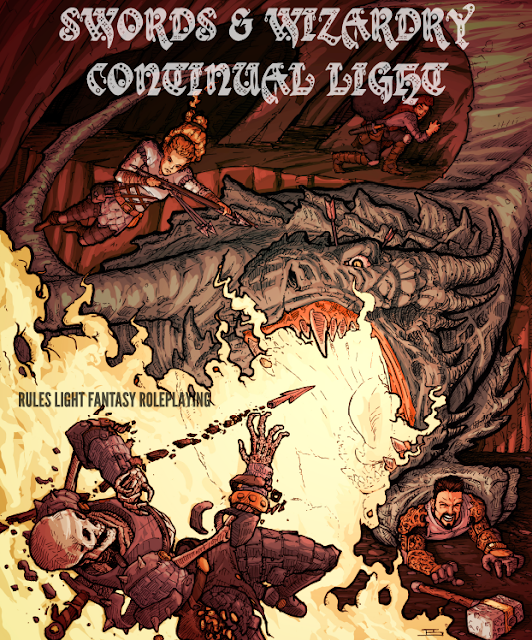 Swords & Wizardry Continual Light "Pre-Release" has 140 Downloads in 11 Hours - Thank You! To say I'm excited is an understatement. 140 downloads in 11 hours of the Swords & Wizardry Continual Light "Pre-Release" rules is simply awesome! 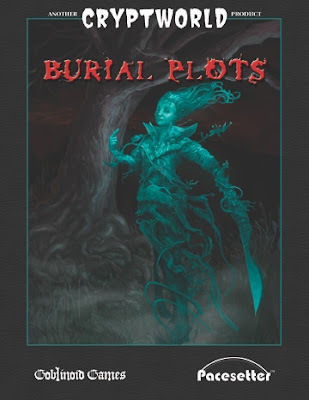 Its a pre-release because I've asked the community to give it a read through and let me know of any corrections needed or omissions there may be. I'm hoping to have a "final" copy ready to be uploaded to OBS this weekend. POD is planned. Pricing will be PWYW in either case. Original post with "Change Log"
There is a large amount of resources for Swords & Wizardry, the bulk of which is written for Swords & Wizardry Complete (SWC). The good news is, converting from SWC to SWCL is a snap if you follow these basic guidelines. 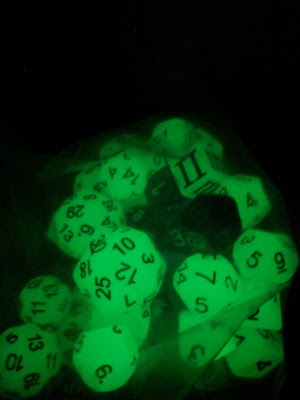 Hit Dice / Hit Points - Decrease HP of SWC monsters by 1 HP per HD in published adventures. Armor Class (AC) - remains unchanged. What is Swords & Wizardry Continual Light? 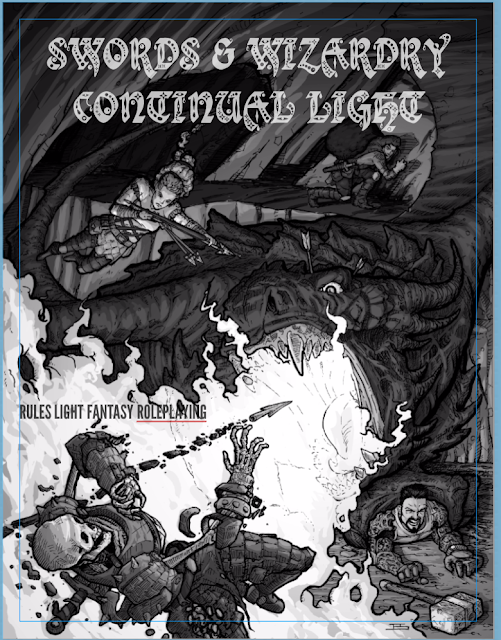 Its 7 levels of old school gaming wrapped up in 18 pages of rules. 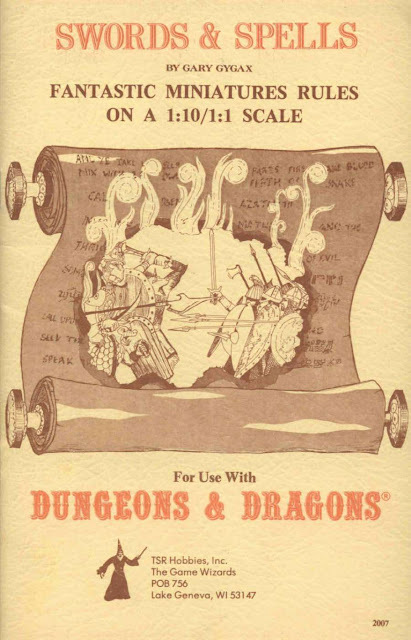 With these rules, a d6 and a d20 and a little imagination, you can run a whole campaign. I'm just going to come out and say it - 50+ pieces of stock art for 50 bucks from an artist of the caliber of +James Shields is beyond ridiculous in pricing. As a small (if not minuscule) self publisher, quality stock art at an affordable price is a necessity. James Shields has you covered. I'm in for $50. Seriously, if you you publish your own work, James Shield's Fantasy Stock Art & RPG Minis needs to be on your list of resources. 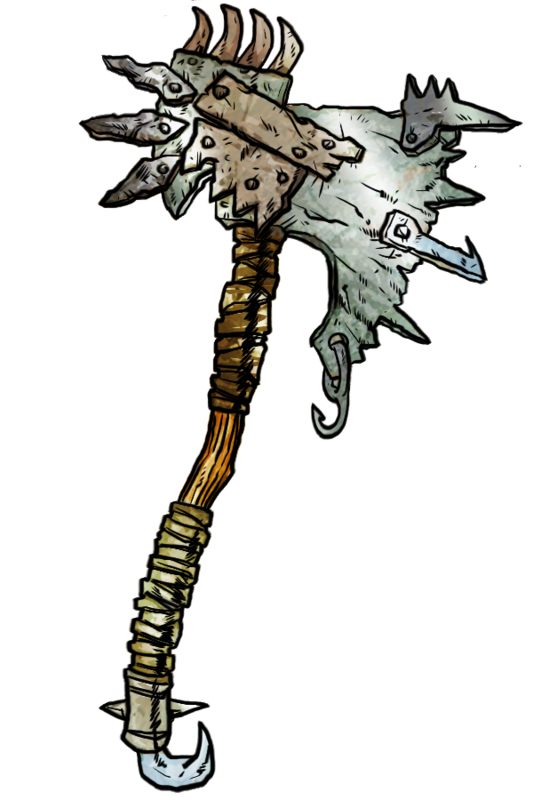 The Goblin Axe of Araz is a weapon created by the most devious mind of goblin-kind, Araz of the Firenose goblin tribe. Araz wanted to supply his tribe with a weapon that would instill fear in their Dwarven enemies. As such, he designed a most fearsome axe, its head bolted with seemingly random hooks and barbs. In truth, this is where the danger lies. While the goblin axe is unbalanced (resulting in a -1 adjustment to all to-hit rolls) its barbs inflict an additional point of damage per hit. Even more dangerous, if the attacker rolls a natural 20 on his / her to hit roll, an additional 1d6 of damage is done due to the hooks and barbs rending flesh. 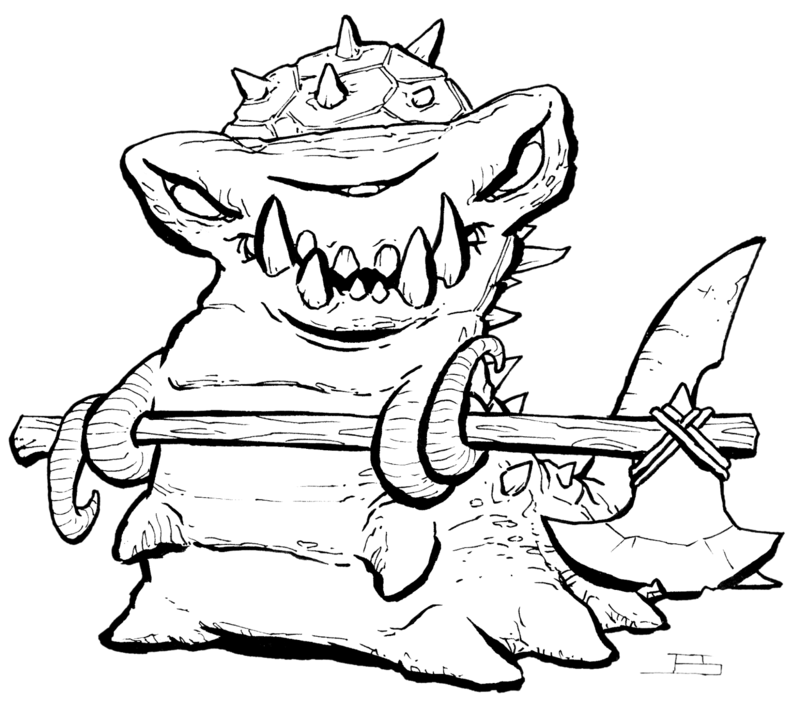 Any dwarf that views a Goblin Axe of Araz in the hands of an adversary is most likely to choose the wielder as a target, as all dwarves know the intent of a Goblin Axe of Araz. Art copyright Rick Hershey, Fat Goblin Games. Used with permission. Thanks to The Tavern's supporters at both The Tavern's Patreon and directly through Paypal, we have a monthly backing of over $150. This means 4 to 5 monsters for Swords & Wizardry Light / OSR per month, 4 to 5 Swords & Wizardry Light / OSR magic / wondrous items per month AND backers at $1.50 a month or higher via Patreon will get a collected PDF of the prior month's releases emailed to them. Paypal backers will need to email me in the middle of October to receive theirs. This is the second release for the month of October.